Posted on August 14, 2010	by Derek "Gamer Crash"
Once again, welcome to Making the Case, where I present the facts and you make the decision. Up this week: Crackdown 2 for the Xbox 360. 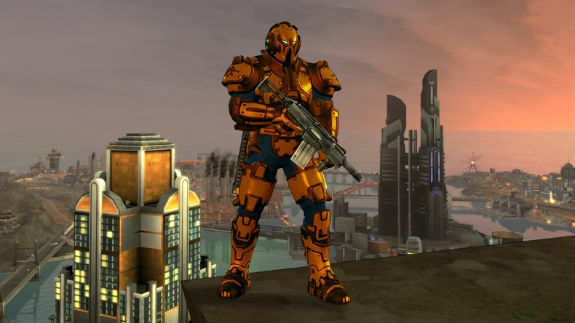 Crackdown came as a surprise to most everyone when it released early in 2007. What was originally supposed to be a throw in to the Halo 3 beta, became a well reviewed and cherished surprise. So when they announced a sequel in 2009, everyone jumped in the air and gave high fives. Do you already suffer from an addiction to collecting orbs? Do you like huge explosions? Do you like picking up large objects like cars and throwing them at your enemies? If you said yes to any of those questions, run immediately to your nearest electronics shop. You won’t be disappointed. For the rest of you, Crackdown 2 is basically more of the same. So if you already enjoyed the first one, you’ll definitely like this. While the game feels a bit familiar, it’s certainly not a bad thing. For only having 8 solid months of development time, Ruffian Games has taken the Crackdown formula and made some tweaks to it. The city is the same as you remember it, only it’s now fallen into disarray so the layout is a little different. It is fun to come to an area and remember what it used to look like or doing something from the first game there. The missions are a bit repetitive but there are enough different ones that it’s not a huge deal. Either way, you’ll end up just jacking around the city climbing buildings, blowing stuff up, or collecting orbs to care much. Guns and cars now unlock based on your driving/weapons skill such as te Agency Tank and the Agency Buggy. There’s some new great weapons ad grenades now as well, including the Flocket Launcher and the UV Shotgun which is comparable to force pushing things. It’s a blast. In the end, the game has enough content to be loads of fun. There is a multiplayer side to Crackdown now, which isn’t revolutionary by any mean, but is still solid and fun. If you can get a group of friends to jump online, this game is truly a blast. And hey, you still have The Voice of the Agency in your ear so that’s a plus. It may not be the best looking 360 game out there, but if gameplay is king for you, give this one a look.